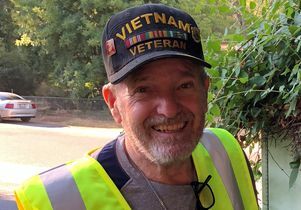 Ric Ryan, 72, fought for his country in Vietnam, has had both knees and one hip replaced and, in August, was struck by a car at a crosswalk. 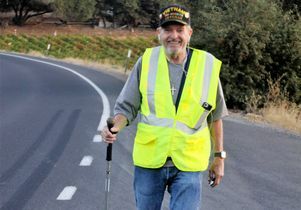 The car accident took him out of action for several weeks, but soon he was back trekking along the streets near his hometown of Murphys, California to raise money for a UCLA program that helps wounded veterans of post 9-11 conflicts, most of whom weren’t even born when Ryan was a Marine fighting in the jungles of Vietnam. In 2008, Ryan saw a TV news story about UCLA Health’s Operation Mend. The program provides specialty medical and psychological health care for veterans injured in the line of duty since the 9-11 terror attacks in 2001, and includes their families in the care. 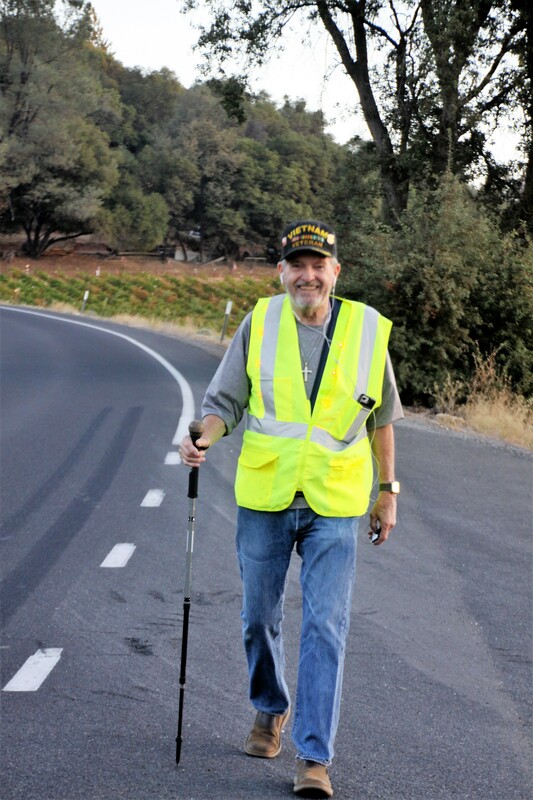 Inspired by the story, he embarked on a one-man fundraising campaign by collecting waves during his regular walks through Murphys, a former gold-mining settlement tucked away in the foothills of the Sierra Nevada Mountains about 340 miles from Los Angeles. Each time someone in a passing car waved at him during a walk, which isn’t uncommon in a tight-knit small town, he would wave back and earmark 25 cents from his savings. Local residents soon heard what he was doing, which led to more waving, and they began pulling over their cars to hand him cash and checks. Ryan has also said that walking regularly has helped him with his post-traumatic stress disorder. Eventually, Ryan set up Operation Mend collection cans around town and people gave even more. The donations ranged anywhere from $1 to $5,000. Two golf tournaments were held which netted more money. Ten years later, Ryan has walked more than 8,000 miles and raised about $125,000 for Operation Mend. On Sept. 22, Ryan went for his celebratory 10th anniversary walk. At 6:50 a.m., wearing his bright yellow vest, he departed from the Chevron station along Highway 4 to begin his walk. With the weather in the high 60s, he walked, singing along to George Strait, Alan Jackson and Reba McEntire on his iPhone. He collected about 60 waves during the four-mile walk — and $15 for Operation Mend. Later, as he sat down for breakfast at a restaurant with his wife, daughter and granddaughter, a young boy whose parents recognized Ryan came over and handed him $5. “That’s my favorite thing to see is when the young kids are supporting our troops too,” Ryan said. Over the years, the Operation Mend team has become family. 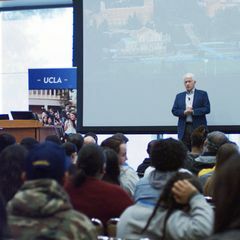 He and his wife, Joanne, visited the Operation Mend program at UCLA in 2011. They walked with patients, medical staff and supporters in the New York City Veterans Day parade in 2014, and will join the parade again this year. 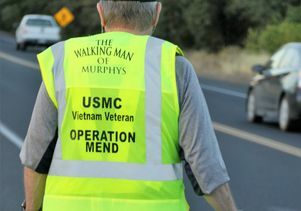 Ric Ryan, 72, a Vietnam veteran who has been raising money for UCLA’s Operation Mend for 10 years through his walks.